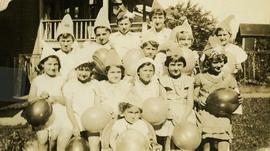 Photograph depicts a group of unidentified children posing in a yard holding balloons and wearing party hats. 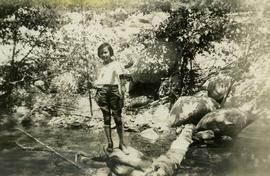 Photograph depicts Charlotte Anne holding a fishing rod standing on a rock in the San Gabriel Canyon. Written on verso: "Charlotte Anne. Fishing in San Gabriel Canyon. April 1934." Photograph depicts an unidentified young child wearing a coat and standing outside what appears to be a store. Photograph depicts Esther Dayson with two unidentified children standing in front of a wooden fence with a house in the background. Photograph depicts Hymie Nemetz (eldest son of Charlie) with his grandmother Toba (Toby). Photograph depicts Nathan Nemetz, in Winnpeg on third birthday. Also see L.16212. Photograph depicts Nathan Nemetz and his son Peter. Photograph depicts the hotel across from Nemetz Store, in Zelma, SK, with baby Milton Nemetz in sled attached to a dog. Other copies available; refer to PastPerfect for details. Portrait of Ada Nemetz and Harold Nemetz as children in fancy dress.